GEO was delighted to present the 2015 Australia Regional events — dedicated to Australian equity compensation in Sydney on 13 October and Melbourne on 15 October. New to GEO? Learn more about GEO membership and benefits. These events promised schedules packed with useful content, knowledgeable speakers and high caliber attendees. 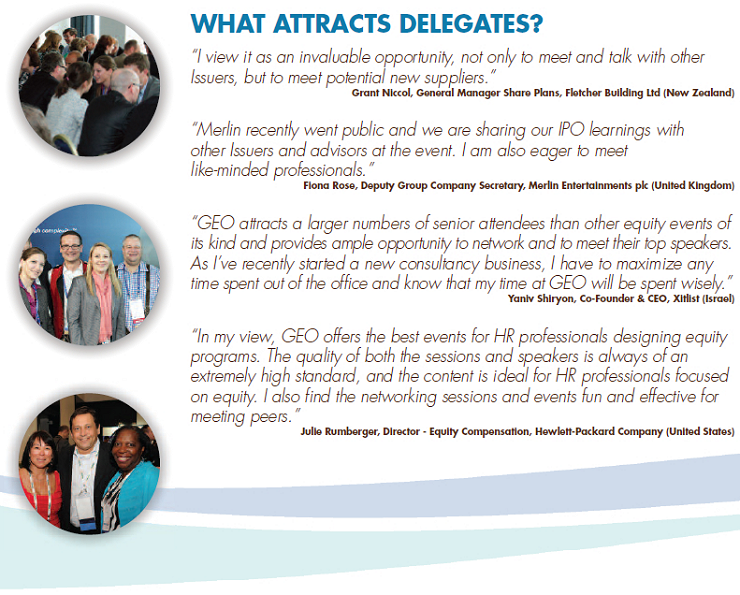 GEO's Australia Regional Events are globally recognized as premier educational and networking opportunities for strategic-minded employee share plan professionals. Each event promises to provide attendees with relevant sessions that address topical issues, delivered by industry-leading experts and thought leaders. Time at a GEO Regional Event is time well spent. Attendees include employees of companies who offer equity compensation as part of their company's compensation packages and serve in the roles of analyst, manager, senior manager, director, senior director, vice president and various other executive level positions in functions such as human resources, accounting, finance, tax and stock plan administration. The delegate population also includes employees and management of the top companies providing services to companies who offer share plans. Member and Non-Member Issuers were welcome to attend this meeting at no charge. Registration was required. The case study will be of a 'sample' ASX listed company which is currently operating a traditional Performance Rights Plan, a Restricted Share Plan and a General Share Plan. It will examine the design changes that could be made to such plans in light of the recent tax and securities law changes, including the pros and cons of making such changes. The case study will also touch on other types of plans that the sample company could consider introducing as a result of the recent tax changes (eg NED plans). The presentation will close with observations from Angela Perry around what companies are currently saying they are likely to implement in terms of design changes and what the political landscape may hold in the future, in light of recent leadership changes. This thought provoking session will canvass observations about the alignment of pay and performance from both available research and practical experience, with particular reference to the role of and implications to equity participation. Hear why effective governance is an important foundation to deliver alignment, all pay decisions are ultimately variable and need to be considered in totality and more! Leave with five core characteristics for effective alignment of pay and performance. This classic favorite will give you an overview of the hottest developments affecting your global share plans. From the recent tax and securities law developments in Australia to changes in the US by the SEC around the CEO Pay Ratio Rule, our presenters will cover all of the latest tax, securities, currency control, employment, data privacy and banking law issues related to equity compensation. Attend this session and avoid being burned by the quickly changing world of global equity! This fast-paced and energetic “best practices” session combines short idea-packed presentations from your colleagues with audience participation—YOU. The result: everyone leaves armed with loads of tried and true practical solutions and valuable resources.